5 Has it met expectations? We have tested the Sony A7RII, the latest camera of the Japanese brand that is intended to satisfy even the most demanding users. Two years before, we met Sony‘s new bet on the world of the image, something that was to be expected after knowing the lines that the Japanese company had marked with its first camera without full-frame mirror. This time it is the A7R II, of which we already value its characteristics. It should be considered an important device in photography. On paper, the Sony A7RII has all the necessary ingredients to satisfy a large number of users. The R range stands out for having a wide resolution, but this time has tried to go further, as they also include some of the functions that some photographers loved the Sony A7S, such as the ability to use high sensitivities of night shoot. With a full frame Exmor R CMOS sensor, it was expected that very fine granules when using high ISOs and great quality even in dimly lit environments. That also reside in Sony A7 II and finally, Sony A7R II improves it. The CMOS Exmor R backlit, seems to work obtaining a luminous image in a dark area is becoming easier. As proof of this we have this test performed with the A7R II, where we obviously lose quality as we raise the sensitivity, but I believe that none of its values ​​are unusable because it shows an excessive granulation or poor definition. It is clear that we would have to test the camera in different night situations to check its actual performance, but for now, its sensor seems to show results that live up to what we were promised. On the other hand, its 42.4 megapixels should be easily usable to make different cuts in our photos, being able to obtain an image totally different from the one we were in the beginning. As we see , it does not matter too much that the object belongs to a small part of the photo. The negative thing is that a greater amount of information will inevitably affect the size of the files, although we can also reduce it from the adjustments. Another advantage of having a full size sensor is that the dynamic range of the shots should be wider than that of a conventional one. Thus, the difference between the whitest point and the blackest point turns out to be wider, resulting in a snapshot with fewer areas burned and underexposed. Although we have not been able to test in depth. The 399 focus points are one of the great qualities of the Sony A7RII for both photography and video. The first impression is that the speed. Where the camera’s focus ability on an object has improved dramatically. That something not quite optimal with the A7 II. On this occasion, the camera even has the possibility to create a tracking pattern to focus on what interests us while we record a video. However, it seems that some aspects of this section still need to be develop, as perhaps the continuous focus on video does not change its focus at the speed we may need. However, we must remember that this is a device in the test phase. Sony A7 R II grip is quite comfortable, which helps us to support it without this being a big problem. With the rear and the front dial, located near the handle, we can quickly change the shutter speed and aperture. Its magnesium alloy body feel of being very robust and resistant camera. With quality materials that give us safety against a possible impact. Usually, the keypad is well distributed, and can even be customized at our whim. What does not end up liking is the button to start recording in video mode. Which continues in the same place since the first Sony A7. The main problem is that it is very close, in a position difficult to access if we want to press. So, it is almost impossible to start a video without not abruptly move the image. It is known that the new Sony camera introduced in August’2015 with a price that will be around 3.500 €. Due to all that it offers, I think we are facing one of the most advanced cameras that can be accessed today. But we must also be clear that it does not compete in a league with the D7200, GH4 or even the Sony A7 II. For this reason, the requirements with this device must be somewhat higher. You cannot compare a Sony A7R II with a Fuji X30. Just as neither can an iPhone 6 with a Moto G, each has its category. So, at the moment it seems that the Sony A7R II complies with what they showed us during their presentation. However, that is just a first impression. To analyze a product as premium needs time and explore each of its technology individually. Something we hope to be able to do in the future. 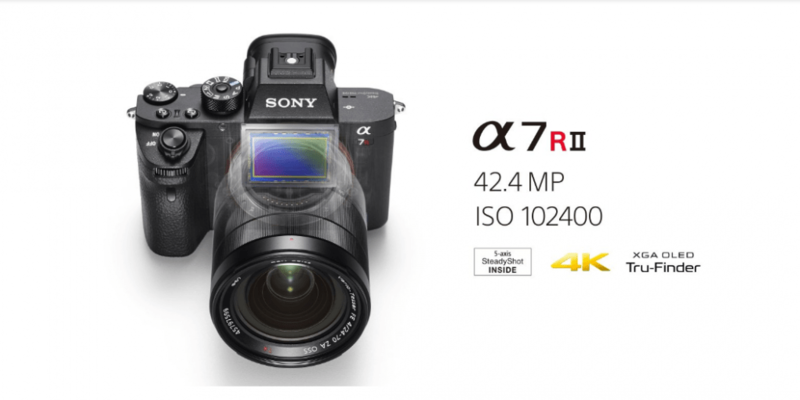 Thing 1: all indications are that the new Sony Alpha 7R II is on track for all records. Thing 2: since I think it is not a good idea for manufacturers to present their products with such a dispersion of c color management. Also for the calibration of the devices. Then the users go crazy. Providing a platform for information, inspiration, interaction and enterprising. Same time that I combine my passion for sports and cameras.